Entering the field of filmmaking never felt like a choice or a moment that I can pick out in time because it has always come so natural to me. With a dad as a photographer and a mom as a formal model, I grew up on the sets of photoshoots. Ever since I was little, I have always been surrounded by cameras, so the arts always felt so comfortable to me. There are times where I can doubt my talent whether it is through competition of other successful young filmmakers or criticism on my work, but one quote has always pushed me to keep going…”To avoid judgment: say nothing, do nothing, be nothing.” In truth, the only person that can stop you from pursuing your dreams is yourself. If you want to make a difference in the world, you have to say something, be someone, and do something. When I came to the Golden Lion Film Festival, I was in awe of all the young filmmakers that shared the same passions as me. After my films had screened and received awards at the festival, so many young filmmakers came up to me and told me that I was their inspiration to keep going and pursue filmmaking. To hear compliments like these is not only extremely rewarding, but gives me a sense of determination in that I have to pursue filmmaking not only for myself, but for other people as well. The festival really showed me a glimpse of how my films can have an impact on others, and how many other students live and breathe filmmaking just like me. It was such an inspiration to witness and such an honor to attend. As a young writer, filmmaker, artist, the most meaningful thing to you is affirmation. Just hearing from someone else that what you have to say is important and that there is a future ahead of you in the arts is akin to being told that you have a voice at all. I am where I am today because in high school I was told—through the Golden Lion Awards and through various kind teachers—that my words deserved an audience. As a Golden Lion judge and as an aspiring TV writer working to empower women and minorities in the industry, I know just how powerful one pat on the back can be. When I won the Golden Lion Awards for best Scriptwriting with my friend, it really confirmed for me that my stories could be powerful and impactful to an audience. 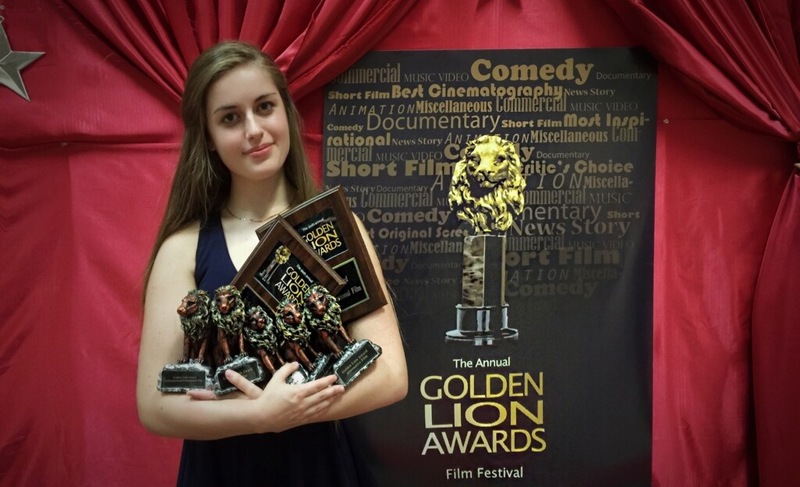 I love that the Golden Lion Awards encourages filmmaking in young adults, especially in women! I’m so happy to see that the film festival is expanding. Still to this day, I remember attending the Golden Lion Awards as one of my fondest memories of high school. It provided such an incredible opportunity to show off my work, and I loved the creative environment that stemmed from so many filmmakers in one room. I try my best to attend the event every year because I always leave feeling so inspired! When I was a filmmaker in the Golden Lion Awards, I gained so much confidence not just as a filmmaker, but as a person. I got to meet many talented students when I attended the festival, and I got to see their work. The fun and encouraging environment kept my faith in pursuing a filmmaking career. It can be scary putting your work out there for people to see, but through the friendly and kind community that is the Golden Lion Awards, it makes it a perfect place to showcase what you have made. I so greatly appreciated the opportunity to be a part of the Golden Lion Awards when I was attending Ursuline and also as I graduated. Being in these awards made me realize how much of an impact my creations on other’s can make in this world. It lets students take their work seriously and thrive in what they do best! The Golden Lion Awards helped me grow not only as a filmmaker, but also as a businesswoman. I have learned both the creative and the practical side of my future as well as how to properly organize and execute filmmaking. The Golden Lion awards provided me with another incentive to make an incredible film. It also provided the payoff of being able to say that I am an award winning filmmaker, which is amazing for my resume and future. The Golden Lion Awards brings together filmmakers from all over the tri-state, and it is a great way for young people to network and continue to grow in their work. I hope that it continues to do what it did for me, encouraging and providing entertainment as well as showing kids that they really can achieve whatever they put their minds to. Having a platform to meet young filmmakers and view student films has itself been a learning experience. Through the Golden Lion Awards, I was pushed to better myself, to learn from others’ techniques, to expand upon my visions, and to reach out to other people like me, all while being celebrated and empowered. As a high schooler from Ohio, it was intimidating to compare my work to student films that came from the “Big Cities,” like Los Angeles or New York City, but I quickly learned that the Golden Lions has set me up for success far more than anywhere else could offer.